One photo of her smiling at Donald (probably photoshopped). You were lucky to find that one among the thousands of her looking desperately miserable (apart from when he's not with her). Could be. Bet I would make her smile though with my music and love and peace and sh1t. Hmm, Im no expert but that doesnt look like a "Beautiful wall", it kinda looks like a fence. With gaps in it. It certainly isn't as long as I thought it was going to be. I think those were Melanias exact words to Trump. No wonder she always looks so miserable. Poor girl. Im sure some of those underfed migrants from south America would squeeze through that "fence" (its not a wall is it?) easily. Your right though, I wouldnt get through it. As for Trump supposedly being a racist! I think that boats sailed long ago. Lets not pretend he isnt one, pleeeeze! But he promised a wall! A beautiful wall. Its a rusty 4km bit of fence. It took em 8 month to put up the 4km of fence. Only another 3120km to go and at that rate it will take them thirty two and a half yeas. I bet all the brick makers in the states are a bit pished off. 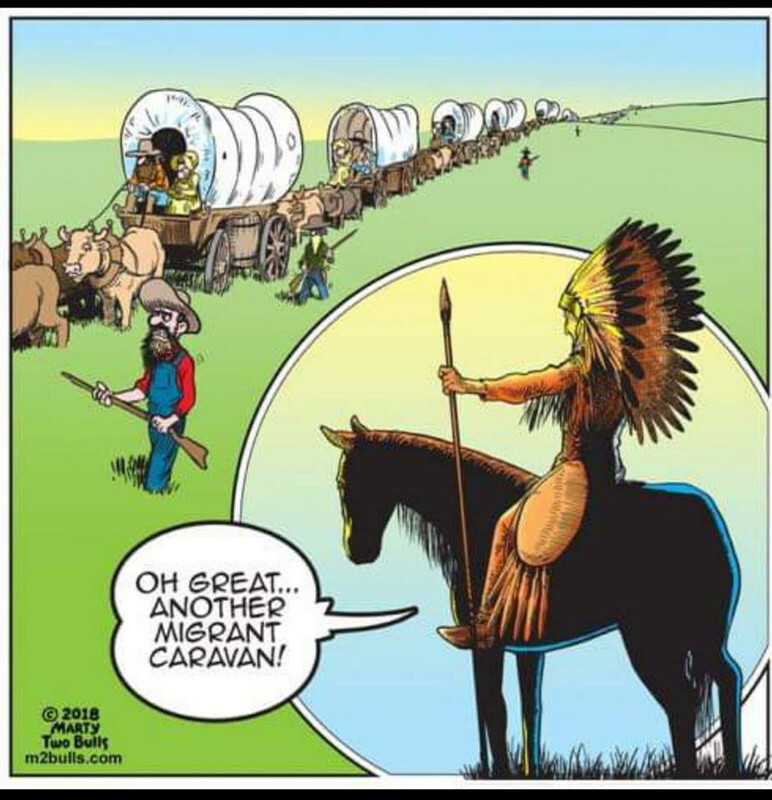 Those migrants in Barry’s cartoon didn’t go on welfare -they stole from the indigenous population instead by decimating the herds of Buffalo upon which they depended for food, clothing and shelter and removing them from the land. To this day large numbers of them in reservations where the experience poverty, unemployment and, most ironically you might think, dependency on welfare. I know you would get the fact that those migrants didn’t go on welfare Antony. My only point being is that it is not the biggest sin in the world to depend on it.